Attrib. wins the Republic of Consciousness!! 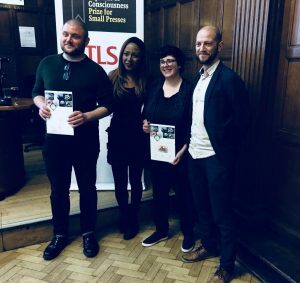 So if you haven't heard, Attrib and Other Stories won the 2018 Republic of Consciousness Prize! Crack open the Lambrini, we're celebrating! It was a total surprise and we're delighted to have been recognised amongst our small press peers. Eley is one of the finest writers around and Attrib is such a great book. You can buy it here. Massive shout outs to Galley Beggar and Preti Tanjea whose We That Are Young is an extraordinary novel, and big ups to all the other shortlisted presses, Little Island, Charco, Dostoevsky Wannabe and Les Fugitives. All worthy winners in our eyes. Thank you to everyone who has bought the book and supported our adventure, we owe this to you!